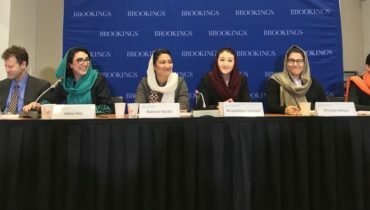 GIWPS > Blog >Do Quotas Actually Help Women in Politics? 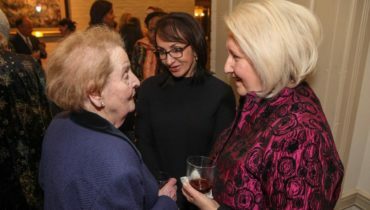 This week, GIWPS executive director Ambassador Melanne Verveer judged a New York Times debate at the World Economic Forum in Davos, Switzerland on the efficacy of gender quotas in politics and the private sector. It’s a complicated topic, but the scholarly evidence is clear: electoral quotas are important to increasing women’s representation in politics. Research shows that quotas are good for women candidates—and their election benefits the wider society. For example, scholars find that states that elect more women are likely to have better pediatric outcomes, spend more on social welfare, and empower women. 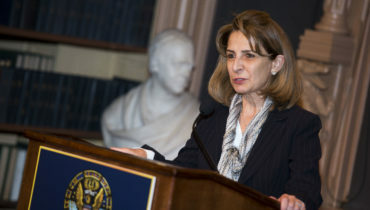 Upcoming research from the Georgetown Institute for Women, Peace, and Security also indicates that gender quotas may be beneficial to women’s civil liberties and access to justice. Simply put, gender quotas are country-level mandates regarding the descriptive (numerical) inclusion of women. There are, however, quite a few types of quota systems. There are quotas that are legally mandated by the country’s constitution and/or electoral law, and then there are voluntary party quotas. Quotas can be implemented at the candidate stage or at the election. Some quotas have severe penalties for non-compliance, and others have little to no sanctions. Where do Quotas come from? Researchers have found that conflict itself can be a significant force in bringing women to office. Conflicts can restructure institutions as well as existing gender norms, opening up space for women in government. Social and political distress have also been identified as important variables in bringing women heads of government to office. In upcoming GIWPS work, we examine the variegate effects of quotas across different types of conflicts including revolutions and civil wars. Policy-makers have different priorities and incentives to introduce electoral gender quotas. These can be tied to broader liberalization efforts, a response to domestic pressure, an act of virtue signaling, or an attempt to bargain for foreign aid. In most cases, it is a combination of these variables, rather than one that motivates states. Unfortunately, there is no hard and fast rule about which type of quota works best; it truly depends on the context. A survey of the existing research illustrates the challenges of trying to decipher what types of gender quotas are most effective. Intuitively, we would expect reserved seats to be more effective than voluntary quotas, especially those with strong sanctions. But an examination of states with these different systems reveals that those with voluntary quotas produce better outcomes. However, there are significant selection issues affecting these results. For example, states that implement reserved seats are comparatively less stable and democratic than those that implement voluntary quotas. So, while this seemingly less aggressive quota system appears as though it is having a stronger effect, this is likely the result of other factors. How long does it take for a gender quota to produce positive results? We still don’t have a great answer for this. If some of the effects of women in office are things like symbolic power, we should expect a lag—perhaps as long as a generation—in inspired women running for office. Alternatively, we might expect other legislative reforms regarding inclusion more immediately. Of course, numbers are not everything. While democracy, per se, hasn’t been shown to affect the implementation of gender quotas, it will of course affect the substantive representation of women. Women might be descriptively well represented in the national legislature in an autocratic state, but their ability to govern will be hamstrung. This post is not a normative defense of gender quotas, but a description of what we know from the existing social science literature. Political arguments against quotas often emphasize that they violate the spirit of meritocracy and free choice—that someone should not get a seat at the table just because they are a woman. I am not going to adjudicate that debate (although I would contend that this conception of meritocracy is based on a very privileged understanding of power). But the research tells us that quotas are the strongest predictor of women’s participation in national legislatures, and that women’s political participation has benefits for the entire population. The exact parameters of the quotas, the time of adoption, and conditions within the state will all affect their efficacy. But quotas do work: with few exceptions, all states that have succeeded in electing more than 30% of women to the national legislature have some sort of quota system. While the topic of electoral gender quotas is controversial, and there is a lot left to learn, the evidence (overwhelmingly) indicates they work. Madison Schramm is a Hillary Rodham Clinton Research Fellow at the Georgetown Institute for Women, Peace and Security. She is also a PhD Candidate International Relations at Georgetown University. What Happened to Washington’s Women Ambassadors? Read More What Happened to Washington’s Women Ambassadors?